Ever wonder what that bright spot in the sky was? Wish you could name the stars, planets, and constellations you can see while sitting around the campfire? Like to know which satellite it is that you have just seen? Well, you could get your sky chart out and try to orientate it. That has certainly worked for me in the past, but with limited success. Some of you might even remember the "Starfinder" which was a miniature cardboard planetarium and astrolabe which showed the constellations visible from 35S in the southern hemisphere. 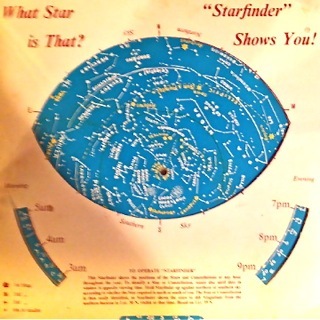 It had a disc, marked with the constellations, which revolved inside a sleeve, with slots cut out, showing the sky at different times and months. Fortunately there are several iPhone apps to help you that are a little more sophisticated. Some use the iPhone's position sensors to determine where in the sky you are looking, the GPS to decide where you are located and the time and date. Once these are decided, it is relatively easy to show you the relevant part of the sky map on the iPhone screen. Calibration is even possible eg Star Walk allows you to view the night sky through the rear camera on your iPhone and superimpose it over features you can recognise on the sky map, before setting. Personally I agree with the rave reviews that Star Walk has been getting and this is my astronomy app of choice. Simple interface helps you learn the night sky by displaying the constellation at which your device is currently pointed. Pocket Universe is an easy-to-use app that will help you learn constellations, bright stars and planets. You can literally hold up your iPhone 3GS/4 in front of you, and the app will use the built-in compass to display the same view of the sky you see - but one that's complete with names and information. iStellar is a planetarium App that shows the starry sky seen from the place and time of your choice. It is optimized for Multi-Touch control, allowing you to operate intuitively; drag to move the star chart, pinch to zoom in and out, and so on. This review by an experienced astronomer outlines the basic features you need, lists the distinguishing features of each and gives advice on how to decide on which to purchase. To make the task easier there is a table listing the features of each.